Hemophobia is an exploration of the fear itself, an experimentation with provoking the feeling of overwhelming, suffocating dread the phobia invokes in someone without the fear at all. 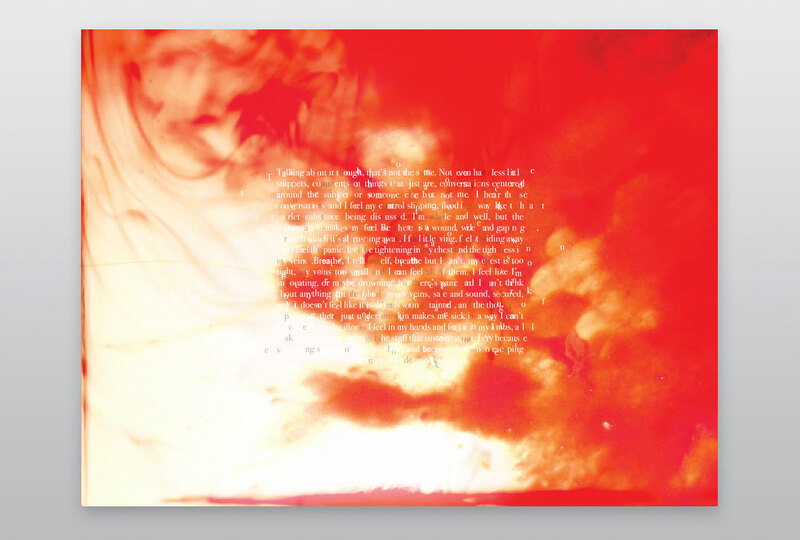 It aims to use imagery, type, and symbolism to steadily build the fear as the project is interacted with. Hemophobia begins as a simple postcard-sized folded mailing; it's almost inconspicious with only a couple small drops of blood to warn what it holds. 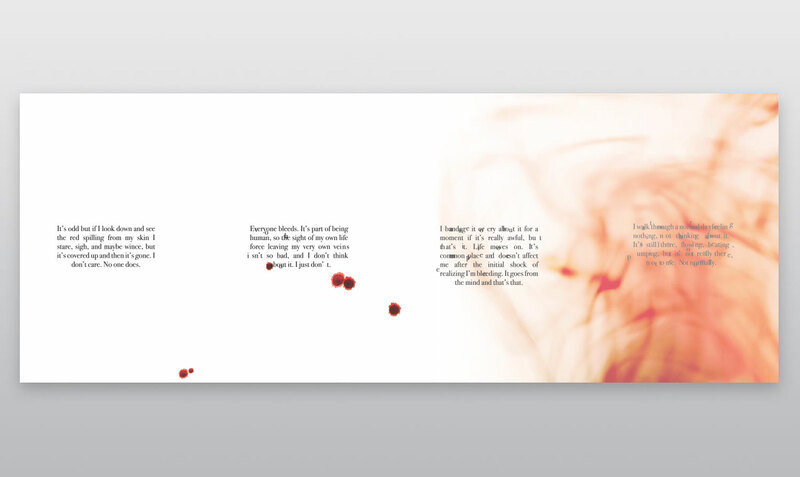 As it is infolded, it reveals increased splatter until the poster itself begins to bleed. When it is opened it begins to reveal the full, sinking horror of hemophobia, the overwhelming red and the fear that starts to tear apart one's rationality. Unfolded to half the size of a movie poster, type begins to break and vibrate as sanguine overtakes the page, seeping closer to total cover. The excerpt begins to shatter on itself as the words become more rushed and panicked. 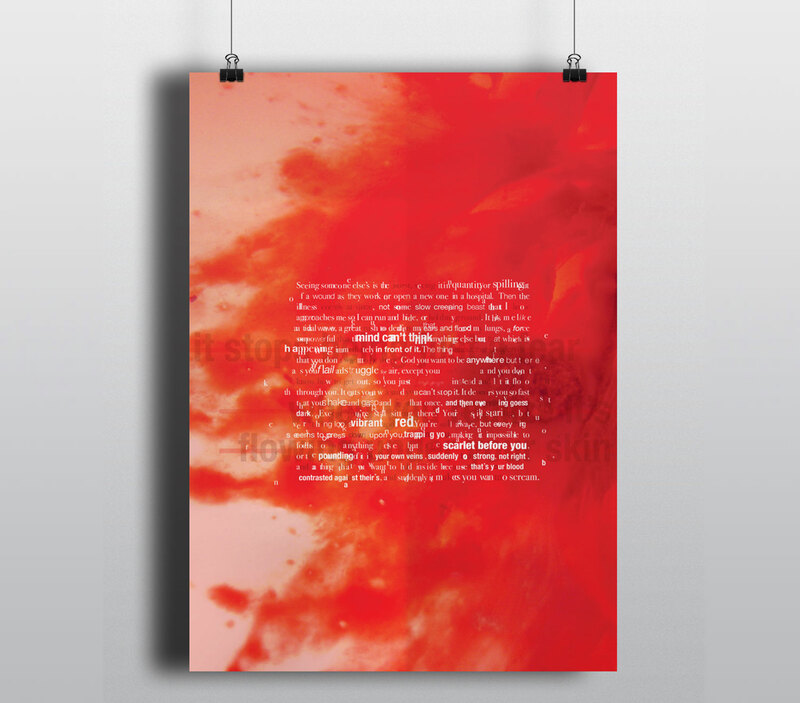 The poster aims to make the reader feel uncomfortable not just from the visceral image of blood, but by disrupting the very paragraph they read, pulling them ever deeper into the fear. Finally unfolded to its full dimensions, Hemophobia becomes a full poster detailing the fear. Type is shattered to represent the break in logic and control, and letters often dance in and out of the blood and the foreground as the sight and knowledge of all the blood in one's body becomes totally, overwhelmingly acute, drowning the hemophobic. At this final step, it is impossible to break away from the blood and how completely enveloped one is in it, just as the fear envelopes all of one's thoughts and threatens to drag a hemophobic into total panic or unconsciousness.